Hi, I’m Heather! Originally from Baltimore where I was surrounded my all imaginable animals growing up- dogs, cats, horses, hamsters, frogs, fish- and I always loved all of them like family (yes, even the fish)…I’m more than happy to answer any questions you might have about RuffCity, so please reach out by completing the contact form! Is your dog's behavior a little ruff? Check out our helpful resources! We don’t believe in large pack walks so instead offer private, individual walks to maximize the exercise, fresh air and dog-to-walker bonding each day. Should we expect the same walker every day? Yes! 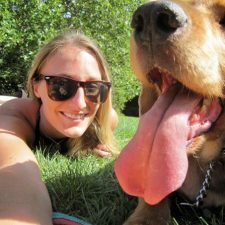 For all full-time clients (4 or more days per Monday – Friday week) we assign each pup to one main walking buddy that sees them everyday pending any planned vacation days or unexpected sick days. In those cases, we will always set your pup up with another buddy so they will never be without their walk! Will we be able to meet our walker before we start walks? Of course! Once we have finalized a schedule, and before the first walk, we will set up a time for your pup’s new pal to come by in person to get familiar with their environment and routine, collect keys (if necessary), etc. What happens if I have to cancel a walk? Are you insured? What does that mean? Each of our walkers is fully insured and bonded by The Business Insurers of the Carolinas through Pet Sitters International . Please visit the site for more info on what our policy covers. Do you take dogs to the dog park? Some dogs live for the dog park! Others do better on long strolls around their neighborhood. Together we can decide what is best for your pup’s daily routine. While we do offer trips to the dog park, please note that our insurance applies a $100 deductible for each incident resulting at a dog park where dogs are voluntarily unleashed, and a signed waiver is required prior to any romps in public NYC dog parks. If you agree to allow us to take your pooch to a dog park, you will be responsible for this deductible should something occur. Will my dog be walked at the same time everyday? While we do our absolute best to arrive at your pup’s specific, assigned walk times, NYC sometimes loves to throw unexpected curve balls, so we do kindly request a one-hour window for arrival time on a daily basis. Is there a fee for same day walk requests? Back to our flexibility pride! We can almost always accommodate last minute walk requests. Please add $5 to our regular rates for walks requested after 7pm the day before for weekday services, and $10 to our regular rates for weekend walks requested after 5pm on Fridays. Interested in joining the RuffCity team? RuffCity is always looking for awesome pup-loving rockstars to join our pack! If you are interested in joining the RuffCity fam, please fill out our application form. Please note that we do require daily and consistent availability, Monday – Friday, from 10am – 4pm for all of our RuffCity team members. We do our absolute best to cover as much of the city as possible! © 2019 RuffCity. Website Design & Website Development by Surf Your Name.